I realize it is only Spring Training. The games don't count, the errors don't count, the batting average doesn't count. None of the stats matter to a certain degree, I suppose. But on the other hand, try telling that to a young prospect trying to make a major league squad. However, Dan Uggla is no young prospect. He's a seasoned veteran who is a critical piece in the Atlanta Braves lineup. 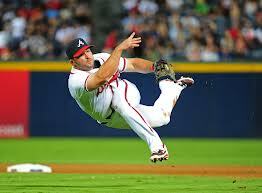 But Uggla has struggled with his game all spring. And he continues to struggle. He's committed a team high six errors up to this point. He's hitting a chilly .210 with only one extra base hit. He's struggling big time. But Uggla has struggled half the time he's been with Atlanta. He has yet to put together a full season of positive production for the Braves since he arrived from the Marlins. Here's hoping the second baseman can turn things around and be the big time player Atlanta needs him to be. For a full and complete season. And the regular season is only a week away, when everything counts then. Don't let things get 'uggly'.